Danny Cheng knows what his future holds- a scholarship to RISD and a career as an artist, with the complete support of his parents. When Danny’s father loses his job as a scientist and inexplicably takes a job as a security guard instead, Danny starts digging into his parents’ past, hoping to learn more about their journey from China, and the death of his older sister before he was born. Danny also knows that his best friend, Harry, will always be part of his life- but he’s not sure how big of a part he’ll be. Through flashbacks, the reader learns the history of Danny’s friendship and years-long yearning for his best friend, Harry, and slowly revealed secrets that have come between Danny’s formerly close group of friends add another layer of depth and sadness to the story. 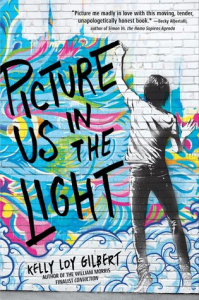 Secrets abound in Picture Us in the Light– secrets kept by Danny’s parents, by his friends, and by Danny himself. It is only by bringing those secrets into the light that Danny and those he loves can move forward and build the lives that they want. Morris Award finalist Gilbert’s writing is lyrical and quiet, and is a truly beautiful narrative of a boy at a turning point in his life, trying to make sense of those around him. 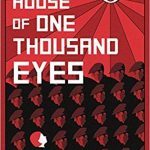 Gilbert’s examination of immigration, combined with a second, anonymous narrative, is thoughtful and heartbreaking, and the final realization of this second story’s connection to Danny’s story makes for a bittersweet but hopeful ending. Suggest Picture Us in the Light to fans of character-driven novels such as I’ll Give You the Sun by Jandy Nelson, Aristotle & Dante Discover the Secrets of the Universe by Benjamin Alire Sáenz, and Where Things Come Back by John Corey Whaley. Leigh Chen Sanders is an artist, best friend, and now the daughter of a devastated and distant father after her mother, Dory’s, recent suicide. Leigh, reeling from her mother’s death, is certain that the red bird who seems to be following her around is actually her mother, trapped between the realms of the living and the dead, and with a message that only Leigh can uncover. Now, according to Buddhist teachings, Leigh has 49 days to travel to Taiwan, her mother’s birth country, to discover what her mother’s spirit it trying to tell her before Dory passes on forever. Traveling to Taiwan means leaving behind Axel, her best friend, whom she kissed for the first time in his basement as her mother was dying at home. 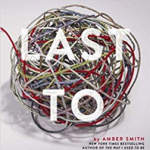 Leigh’s guilt and sorrow over her mother’s suicide are intertwined with her confusion and excitement regarding the possibility of love with her life-long friend, and flashbacks of the year leading up to this pivotal moment give readers the background necessary to understand Leigh’s relationship with both of these incredibly important people in her life. Traveling to Taiwan also means facing the ghosts of Dory’s (and father’s) past, and getting to know the grandparents and family friends who have remained strangers until now. Leigh struggles with the language barrier, as well as the cultural barriers and misunderstandings, between herself and her new-found family, as she learns more about her who mother was, where she came from, and why her life ended so tragically. 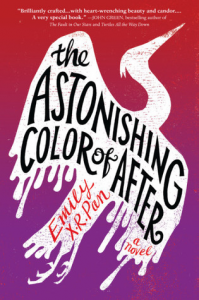 Debut author Pan’s ambitious work of magical realism is beautifully written, especially when Leigh, a passionate artist, uses colors to describe everything from feelings to sounds to temperatures. The main plot of chasing Dory’s spirit to Taiwan is interspersed with memories of Leigh’s own childhood (through the points of view of herself and her parents) and the year leading up to her mother’s suicide, and the unfolding mysteries are masterfully revealed in an emotional climax that is both satisfying and magical. 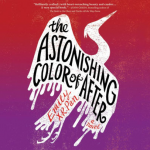 Recommend The Astonishing Color of After to fans of magical realism and art in novels, such as Laura Ruby’s Bone Gap, Leslye Walton’s The Strange and Beautiful Sorrows of Ava Lavender, and Anna-Marie McLemore’s The Weight of Feathers. Marvin Johnson’s twin brother, Tyler, has begun to drift away recently. While Marvin identifies as a “geeky black boy” with his sights set on MIT, Tyler has begun to hang out with a local drug dealer, and Marvin’s worried about his brother’s new friends (while also a bit envious that Tyler can easily fit in to their rough neighborhood). Before Marvin can really talk to his brother to express his concerns, Tyler goes missing after a party, and then a video surfaces that shows Tyler being shot and killed by police. In the aftermath of Tyler’s murder, their mother unravels, their father attempts to support Marvin through letters from prison, and Marvin takes on the cause of making sure that Tyler is remembered and understood as more than a trending hashtag—as a person, brother, son, and friend who mattered. Peers who are at first sympathetic to Marvin’s loss soon begin to blame Tyler for his own death, because he was at a party, at the wrong place, with the wrong people, wearing the wrong clothes. Marvin is determined that people see and remember Tyler as the gentle, loving, complicated boy who didn’t deserve to be shot and killed because police were scared of the color of his skin. 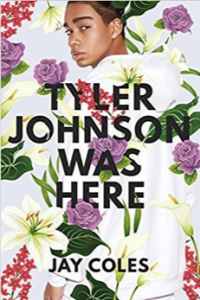 Debut author Coles deftly weaves Marvin’s grief, guilt and outrage at Tyler’s death with his own journey towards finding his voice in the face of racism, violence and ignorance. Marvin is determined to use that voice, and the voices of others in his neighborhood, to fight against the institutional racism that resulted in Tyler’s death, and to make other understand the injustice and hear the stories of Tyler and other black men and women, from Emmett Till to Tamir Rice. Coles’ writing is thoughtful and lyrical, and his story is an important addition to the growing body of Young Adult fiction dealing with racism, police brutality and the Black Lives Matter movement. 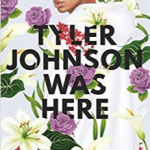 Readers who were affected by Angie Thomas’ The Hate U Give, Nic Stone’s Dear Martin, and Jewell Parker Rhodes’ Ghost Boys will be both enraged and devastated by Tyler’s story, and inspired by Marvin’s determination to make sure that people remember that #tylerjohnsonwashere.